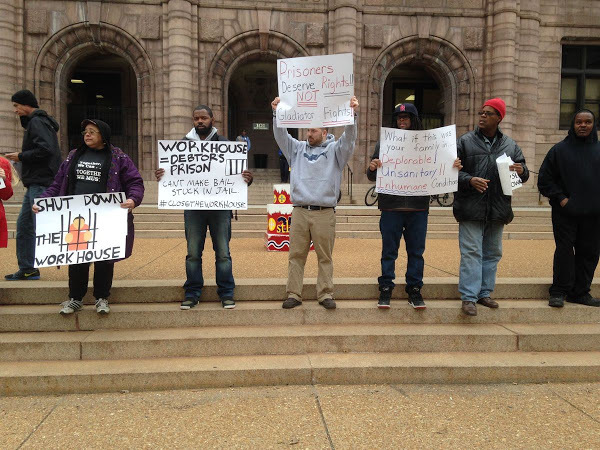 This post is part of an ongoing collaboration between DecarcerateSTL, the Coalition Against Police Crimes and Repression (CAPCR), and Team TIF. Around the country, there is a growing consensus that the long standing practice of “cash bail,” or requiring someone in jail to post their entire bond amount before being released, is not only cruel, but also unconstitutional. Cash bail is a practice that traps low income people, primarily people of color, in municipal jails prior to ever being convicted of a crime. While those with financial means can pay for their freedom while awaiting trial, our city’s poorest residents often lose their jobs and face eviction and homelessness because they can not afford to post a bond for low level offenses. Locally, St. Louis’ cash bail system keeps thousands of city residents in a system where poverty wage jobs and predatory financial service charges combine with an exploitative cash bail system to make poverty truly expensive for people already driven to society’s margins. Around the country, states and municipalities are abandoning the inequitable practice of the cash bail system. New Orleans has already acted and DC provides a decades-long example of a successful no-bail pretrial system. At the state level, New Jersey, Illinois and Arizona are transitioning to a no-bail system, with Utah and California are currently considering their own cash bail reform laws. Nationally, this summer saw the beginning of reform advocacy in the US Senate, where Sens. Kamala Harris (D-CA) and Rand Paul (R-KY) urged us to look at reforms at higher levels of government. The movement away from using cash bail is one that is growing and spreading. While reforms are seeing success in other places, St. Louis is still operating an unjust and costly cash bail system. However, local efforts continue to shine a spotlight on the need to change this. Numerous successful fundraisers to free people held on cash bail have engaged a wide audience online, including the Mother’s Day National Mothers Bail Out and local Black Mama’s Bail Out. Attorneys at ArchCity Defenders played a key role in keeping this issue on the forefront of the local criminal justice reform movement by filing suit against municipalities operating debtor’s prisons. This summer’s mobilization around the Workhouse also put the issue of the inequitable cash bail system back on the city’s radar. It is long past time that our city and Circuit Attorney work together to stop this terrible practice. Beyond the moral imperative, ending the cash bail system could save the city millions. These savings could be allocated towards community resources and programs that are proven to help reduce and prevent crime. Our refusal to abandon this cruel system is detrimental to both equal justice and our city’s finances. Following DecarcerateSTL’s showing of the film 13th at KDHX, members of Team TIF and DecarcerateSTL decided to look at fiscal opportunities offered by ending cash bail. They contacted the Coalition Against Police Crimes and Repression (CAPCR) to ask if they would also be interested in joining the collaboration. The three organizations then began investigating the fiscal benefits of ending cash bail. Ending cash bail is not only a just thing to do, it’s an effective way to redirect existing city resources to fund the often proposed St. Louis Metro Police Department (SLMPD) social worker program. This program is repeatedly suggested as being part of reforming the SLMPD to focus on new approaches to public safety outside of the “arrest and incarcerate” model. Unfortunately, public officials have yet to put forward a comprehensive plan for financing this program. Without robust funding, implementation is impossible. Implicit in our recommendation is a recognition that our white supremacist criminal justice system is very expensive to maintain. Often times, local leaders refuse to imagine the possibilities of change outside of the most minor of tinkerings. This summer’s activism around the Workhouse led to city officials petitioning the state government to increase the state’s share of costs for city correctional facilities. This is neither a bold or pragmatic approach to reducing the city’s costs. The state just has to refuse to increase the reimbursement rate and that plan comes to a screeching halt. The city simply doesn’t have the ability to force the state to significantly increase their reimbursement rate. On the other hand, the liberation-minded approach of ending cash bail altogether is a far simpler, more humane, and effective method of reducing costs. Our analysis found that releasing detainees could save the city millions in dollars per year. Millions of dollars that our city could use to fund public safety activities outside of the arrest and incarcerate model that continues to fail to produce a safer and more just city. Ending cash bail is within the purview of local officials, and can be done without relying on a Missouri legislature that is often hostile to things that financially benefit the city. The Circuit Attorney’s office has broad discretion on the use of bail, and the city’s Board of Aldermen could simply pass a resolution asking that her office stop using cash bail for lesser offenses. If our local officials, along with the Mayor’s office, took steps to implement an alternative system, we have the power to begin making these changes, without permission from Jefferson City. To find the cost savings per detainee, our collaborative developed an analysis included in the embedded spreadsheets. Below are guiding methods. Numbers for these tables come from city budget documents provided by Alderwoman Megan Green. We are basing our analysis on the city’s total budgeted Workhouse (Hall Street Jail/St. Louis’ Medium Security Institution) costs. Savings projections are based on the modelling different percentages of reductions to the number of detainees in the Workhouse. To figure savings per released detainee, we took the total yearly budgeted Workhouse costs and divided that by the number of detainees. In no scenario do we show a 100% savings per reduced detainee. There are costs that are more static, such as maintenance and utility fees on the facility and some necessary staffing that isn’t dependent on smaller shifts in population. This means it is impossible to achieve 100% savings in the system, per detainee not held on pretrial bail. In our scenarios, we made a base estimate of 65% savings, but we also included estimates for 60%, 50%, and 40% savings rates. The base scenario on each table assumes that the amount we’ve budgeted for the Workhouse is pre-reimbursement by the state. If that number is post-reimbursement, then savings could be much higher. The post-reimbursement scenario is on the bottom of each page in navy blue. Each scenario includes tables showing a possible social worker program that could be funded by the reduction in Workhouse costs. We believe the version presented with the 50% reduction to be the best plan. Under that plan, each of the city’s 6 police districts would have 7 social workers, with 2 supervisors per district. Those supervisors would then report to a citywide program director. In the 40% and 25% scenarios, scaled down versions are shown. It should be noted that if the city’s budgeted costs are post-reimbursement, then each level would likely be able to afford the social worker program that is associated with the next higher scenario. In other words, if the city’s budgeted amount is post-reimbursement, then the 25% reduction scenario would possibly fund the 40% reduction social worker plan. In turn, a 40% reduction could fund the plan originally fundable by a 50% reduction. The pay scale for social workers is based off of Missouri’s Probation and Parole Officers’ pay scale. Parole officers have many of the same job duties and functions, as a social worker. Most do not carry guns and they are, essentially, specialized social workers. We felt this job most closely resembled the idea of social workers that would be embedded within SLMPD. The salary numbers we settled on are above the lowest step on the MO payscale, as we have notoriously low pay for our state’s employees. Living in the city isn’t cheap, and we felt that starting at the state’s lowest pay rate would hinder recruitment. The 50% fringe cost estimate is standard. As reflected in the tables, it is likely that we could find the savings necessary to fund the much talked about–but never realized in concrete dollar terms–SLMPD social worker program. It is expensive to continue this system of unnecessary and abusive confinement. By reducing the city’s use of cash bail, we could simultaneously free up the monies necessary to implement a needed crime prevention program that seems to be almost universally desired by our elected officials. Undoubtedly, there are other ways that we could reimagine our approach to public safety in ways that would not only be more humane, but also free up monies for need programs that focus on root causes and prevention, instead of the current arrest and incarcerate model. This is the kind of creative problem solving needed to fund criminal justice reforms. The city has limited revenue and we have to use it in manners that advance the cause of building a more equitable St. Louis. By ending cash bail, we would then be able to redirect these monies towards a re-envisioning of public safety that moves our society away from the arrest and incarcerate approach that continues to fail at both keeping us safe and protecting our liberties. The city is in a tough financial position. We need the most justice we can get for our tax dollars.